I’m sure some of you have guessed by now…it’s hard being a healthy living blogger when you’re sick every day and living on peanut butter and jelly…but here’s the official announcement! I’ll be back tomorrow with all the details, but for now just know that hubby & I couldn’t be more thrilled…and we want to thank all of YOU for the positive thoughts/prayers/well wishes over the past few months. We know it’s no coincidence that this happened the month after we shared our struggles on the blog and had all of you sending so much love our way! PS. We leaked the news on social media last night. Thank you so much for all your kind words and excitement! You guys are the best! Yay! Congrats!!! I read your post about your struggles (one of the first posts of yours I ever read) and have been hoping this would happen for you soon. I’m very excited for you! My heart is literally so happy. You two are going to be such wonderful parents!! Woot!!!! So excited to see this on IG earlier. You guys are going to be awesome parents! Awww, congrats! So happy for you! This is so so so exciting. I’m so happy for you!! Can’t wait to meet the little bean! Congratulations! So excited for you guys!!!! TOTALLY didn’t see that one coming! Congratulations!! I’m also due in October (our first), so it’ll be exciting to read more about your journey!! xoxoxo you are going to be a WONDERFUL momma! Congrats!! Amazing news and adorable announcement pics;-) wishing you a happy & healthy pregnancy! That is such wonderful news!!! Congratulations to you both! I could not be happier for you. Congrats again! awwww yayyyayayayay! congratulations! I can’t wait to follow this new chapter of your life! 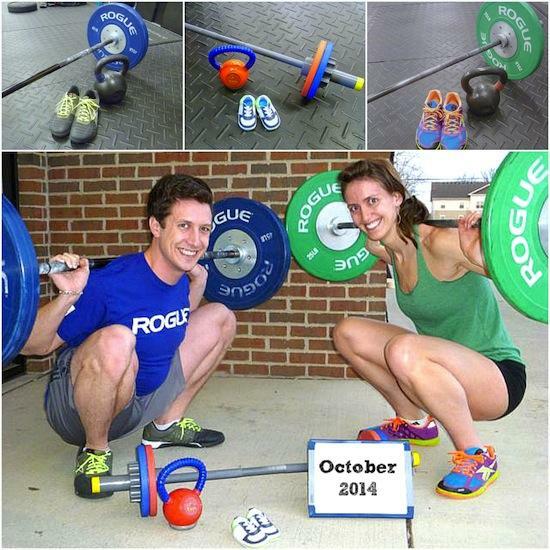 Loveeeee the CrossFit photo announcement! so adorable! you know i am beyond excited for a little bean! so happy for you! I now it was a long journey coming.. CONGRATS!!!!!!!!!!!!!!!!!!! YAYYYY!!!!!! Fighting through struggles come some of the best days of our lives. You are stronger! CONGRATULATIONS! I can’t help but shout it. 🙂 So happy for you! CONGRATULATIONS!!! I was so so happy to read this!! Congrats Lindsay – that is amazing news!!! Yay!!!! So very excited for you. What fantastic news! HOORAY!!! There is an explosion of blogging babies coming this year- I love it! And I am so, so thrilled for you!! OMG, a #babybean!!!!!!! SO exciting! Congratulations!!!!! Yey, Yey, Yey, Yey, Yey! Congratulations!!!! I am so so so excited for both of you! Sending my best wishes your way! Congratulations, girl!! I’m so happy for you and Mr. Bean! Congrats! I swear I teared up a little when I saw the picture especially after reading the post about your struggles. CONGRATULATIONS TO YOU BOTH!!! I’m so glad that this finally happened for you, and I hope you’re on your way to feeling better quickly. Congratulations!! What amazing news 🙂 I’ll be sending good thoughts your way for the next several months. I am really SO excited for you. I am blown away by the timing – I really think there is something so powerful about being honest with your emotions and opening up and “letting it go” … and then getting what you’ve been stressing out about so much all along. CONGRATULATIONS! it’s powerful indeed. thanks megan! Ahhhh…congratulations Lindsay! I’m so, so happy for you!!! Congratulations!!!!!!!!!!!! I’m so happy for you! Congratulations, so excited for you!!! Congratulations! I am so happy for you both! Excited to follow you through this blessing. I wish blog comments had emojis…. they allow far more than 140 characters. Love, love, love!!! I am so happy for you guys, and I love the announcement photos! Congratulations! I am so happy for you both! Excited to follow you through this blessing! im sooooo happy for you guys! Congratulations and hugs to you. Congratulations to you! Happy news indeed! We went through the same thing also, but came through. Sometimes our timing is not God’s timing. We see the blessing of what is and not on what could have been. I think of what I would have missed in my now children if things were on my timetable! So God bless your little family as it grows and will look forward to what He has in store for you! Hmmm, looks like my comment disappeared. CONGRATS! Super exciting news. Congrats!! Love your announcement pic!! CONGRATS!!!! What fantastic news! Love the picture….and the hashtag! Too cute. Hope you start to feel better soon. this is the best!!! can’t wait to hear more! Was so so thrilled to learn this news last month (and that is the only happy excuse you’d get for missing us at Blog Brulee this year – ha!) But seriously, just so happy for you & your hubby – hoping you are feeling good, too! haha maybe just move blog brulee up a month for me? i’ll be there next year! Yay!!!! So happy for you both!!! Such exciting news Lindsay! Congratulations! I absolutely love the little Crossfit gear. I never knew I could be so excited for someone I’ve never met until some of my favorite bloggers started getting pregnant. So happy for you both. OMG!!!!!!!!!!!!!!!!!!!!!!!!!!!! Congrats!!!!!!!!!!!!!!!!! So excited for you!!!! Aww!! Congrats to you both!! Love your announcement picture!! YAYYYY BABY BEAN!!! Congratulations to you both this is wonderful news!! When I saw this on IG I literally squealed with excitement for you! I know you opened up about your struggles, and I just am so happy that the timing is here! Congrats friend! I kept hoping to see a post like this! Congratulations! We’re bump buddies, I’m due in September. I was also super sick, so just hang in there. It should get better. yay! congrats to you as well! Yayayayay! Congratulations, you must be thrilled! I knew it would happen for you two! Sometimes it just takes a while, but I’m sure now you know the wait was worth it. Congrats and good luck! Already congratulated your hubby on IG, but I wanted to stop in and say it here too. October is an auspicious birthday month (both my boys are born in it)… the heaviest part of your pregnancy won’t be in crazy heat or crippling cold. haha love it! thanks hannah! I’m DUE IN October too!!!!!!!!!!!!!!!!!!!!!!!!!!!!!!!!!!! CONGRATS!!!!!!!!!!!!!! SO HAPPY FOR YOU!!!!!! yay! love that we’re so close! Aw! Congrats Lindsay 🙂 Very exciting!! so glad it helped! and thanks! You and hubby are going to be the best parents in the whole wide world! Congratulations!! I am so happy for you! This is such great news and I hope you are feeling better very soon! CONGRATULATIONS!!!! Yay for Baby Bean!! haha so cute. thanks tara! Congratulations Mr. and Mrs. Bean!! Little Bean is going to be such a cutie, and you’ll both make wonderful parents. I have struggled with reproduction problems for years and my husband and I have been trying to conceive for over 7 years. I completely understand how social media affects us regarding birth announcements and baby pictures, but I haven’t lost hope. Your announcement today is proof that miracles do happen and you have given me a new sense of hope. Thank you. I look forward to the up and coming baby posts. LOVE LOVE LOVE. SO excited for you guys!! Congratulations! whew so glad the cat is out of the bag so I didn’t say something 🙂 super excited for you! Congratulations to you and your family! I love the creative announcement photo! Yay! So happy for you two!!! 🙂 Congratulations! Congratulations! Love the announcement photos! Such a fun unique idea! BABY BEAN!!!!!!! Snapchat is about to get REAL FUN. Oh yay congrats!!! Of course it happens after recollecting on struggles – c’est la vie!! I got pregnant after throwing in the towel and deciding to really devote to another semester of school haha! Can’t wait to hear more about baby bean!! haha funny how life works isn’t it? Congrats! So excited for you two! There must be something in the food blogger water because it seems like all the food blogs I follow have a little one coming. Love the announcement! pretty crazy right?! definitely a popular time!